PLEK is a unique computer controlled precision robot developed by the German company A+D Guitarrentechnologie GmbH in Berlin. The machine measures the neck, fretboard, and frets and finds differences within a thousand of a millimetre. These differences is then sanded off with tolerances within a hundred of a millimetre, all in one machine. A machine? Can a machine really adjust something as personal as a guitar or bass? Yes, it really can! Even though great instruments are built nowadays, there are deficiencies in both factory made and hand made instruments. Small (and sometimes big, for that matter) deficiencies in precision, that makes the guitars or basses less sonic, and not as playable as they could be. These deficiencies can now be eliminated with this new technical invention. The result is a better sounding instrument, which also is a lot easier to play. Earlier there used to exist eleven PLEK-machines in the USA, two in England, one in Germany and one in Australia. Now there's also a PLEK at GuitarLabs in Stockholm. The technology has drawn a lot of attention in international press with brilliant praise. We met Uffe, Hasse and Ricky one sunny Sunday in GuitarLabs workshop. With us we had two old, faithful servants that lately had started being a bit troublesome with the frets. One buzzing Gibson Les Paul, and one Fender Telecaster that had some dead notes because of uneven frets. Before the treatment is started, the guitar is carefully checked by the guys at GuitarLabs. Even though the machine does wonders, it is the operators guitar knowledge that is most critical. (Imagine a chef without taste buds. Not a hit, really.) 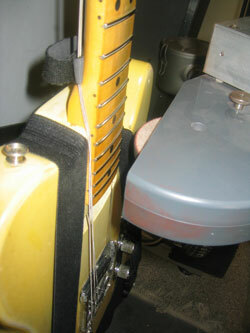 After the human control, the guitar is fixed in a cradle (or jig in guitar-tech-jargon). Then it is controlled, with the help of a matrix, that it sits straight and that everything except the frets is out of reach from moving parts of the machine. This procedure eliminates the risk that something would be touched and broken by the machine. I admit that I was a bit worried about that before I learned how the whole thing worked. It proved to be unjustified fear. With the guitar well secured and adjusted, she takes place in the jaws of the PLEK-robot. Or, safe arms, we should say. With every moment in the process that the guys at GuitarLabs run through, the more safe we begin to feel. 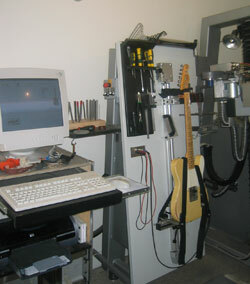 With the guitar in place, we start filling in data about the object in the PLEK-machines database. The dimensions of the neck is controlled by hand with a calliper and written into the machines computer. Also data as type of guitar, model, owner and string action is registered and saved. All so that you, as a customer, shall be able to get back to GuitarLabs and get your guitar adjusted exactly the same, if you wish. When all the facts are registered, the machine and the operator checks once more that everything is secured in place before the PLEK starts its first round of measuring. The robot now systematically moves over the guitar neck, measures and registers all deficiencies. When the measuring is finished and the machine has registered all necessary data, these are presented on the computers monitor. The deficiencies are presented as graphic diagrams, one for each string. The diagrams show the machines calculated optimum values together with the values of the measured guitar, and any differences between these values are seen. Now it's possible to adjust the values on every separate string on the monitor until satisfaction is visually achieved. If the truss rod needs adjustment itÕs done, and the procedure above is repeated until the neck is optimally adjusted. Now itÕs time for sanding the frets. The strings are removed, and the machine measures how the neck has moved when there no longer is any string tension on the neck. The measurement tool swings away, and the machine switch to a fine grained sanding wheel. The machine sands all frets thoroughly and you can really see the precision it works with. When all fret milling is done, the strings are put back on, the guitar is tuned up, and control measured again. If the machine is pleased, it moves on to the next step. The strings are removed again, and the machine starts polishing the crown of the frets with a felt wheel and some fine polishing paste, so that the surface of the frets become perfect. When this is done, the guitar is pretty much ready. Now the human takes over again and the guys at GuitarLabs finish off with a last adjustment of the nut and bridge. 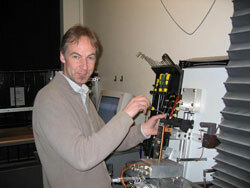 The strings go back on again and the machine makes a last measurement to establish that everything is perfect. In the last step the guitar is intonated by hand. Well, how was the result of this treatment? As one can understand from the beginning of this review, we had our doubts. Can a machine really succeed in something that it takes years for a guitar technician to learn? The answer is really; yes. To a great deal, at least. PLEK works with a precision that it's hard for a human to match up with. When fret milling is done by hand, it's very easy to take away too much on one fret, resulting in a need to compensate the height on all other frets to match. This is avoided with PLEK. The machine removes, within a hundred of a millimetre, as much as needed. The string height can, with the aid of this precision, be adjusted ridiculously low if wanted. What the machine does not do, is adjusting the fret slots in the nut, and buffing of the frets to the final, shimmering lustre. It should be added, however, that the machine is only as good as its operators. One has to have good guitar technician skills to get the most out of the machine. Something that the guys at GuitarLabs really has. Our instruments came back to life after the PLEKing. The guitars play, sound, and intonates much better than they have in a long time. If you have a guitar or bass with a problem neck, or frets that you want to remove as little as possible from, then PLEK is the perfect tool. Price for a complete PLEK treatment: 1650 SEK.